Whenever I am unfortunate enough to watch the local news, I always notice a striking irony. When the anchors are not reciting The Daily Chronicle of Woe and Murder, they banter. And they banter cutesy, amiably, like small town provincials. Never mind that they were just reading terrible news. Never mind that they as anchors living in a major world city would be expected to be sophisticates and cosmopolitans, who could converse about any news story with ease. When they banter, they don't seem like they are that knowledgeable about city or world events. But when they banter they display their humanity, and it's much more preferable to watch as a viewer than the grim news they recite. 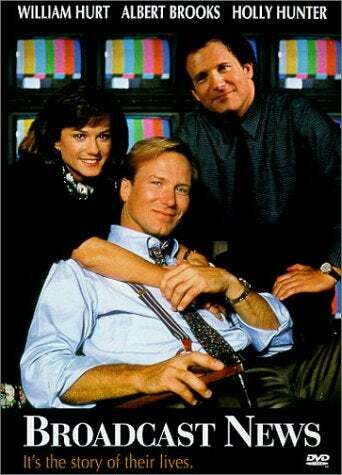 James Brooks' Broadcast News is a satire of when, among other things, real news became exploitative entertainment all local news stations take now as their blueprint. But it's interested in the anchors too, and the moments when they are wretchedly human. Unlike the other, recent critical look at the TV news complex, Nightcrawler, the movie is a gentle satire, and is humane. The crummy way things are in the business is not the direct subject, but just the very lived-in world these characters, well, live in. For these characters to make a stand, to have them protest until they change the system, is not and cannot be done. This is the world they live in, the world their normal, messy, emotional lives play out in. So we have three characters: Jane, Tom, and Aaron. Jane likes both men but can only love one. I would be satisfied forever more if Holly Hunter eschewed every other part except this type of character. She doesn't need to play an alcoholic cop, or a randy secretary, or a deaf mute, or a cult feminist leader. Just put her in romantic comedies from now until the end of her career. Where she plays feisty, intelligent, screwed up women. Make her bawl in every film. I didn't know this was a thing; I just thought she did it once in Raising Arizona. But her sobbing is hilarious, and meant to be. Jane is a completely winning and endearing character. Tom is the good guy lunkhead. He's a nice guy. He is very handsome. He's also emotionally intelligent and generally but not when it comes to news. He sometimes doesn't understand what he's reading. I didn't view this as a moral failing, because a lot of good, kind people don't care about current events and keeping up with the daily news. He is, in my opinion, a much better prospect for Jane than Aaron. Who is written as a jerk. Starting in high school. He's smart but he is a prick as Tom says. And he doesn't have a healthy ego: he jokes around when taking in bad news, and he attacks. Spoiler for the end of the movie. I really wanted Jane and Tom to get on that plane. Tom's lie I did not see coming. It seems out of character initially, because he's a nice guy. But going slightly over the edge (he was going to cry anyway to that woman) doesn't seem like a big deal, but enough of those and you have maybe Brian Williams in a few years time. Brooks complicates our expectations and what we feel for our characters. A traditional romantic comedy would end with them on their way to London, with Jane happy for once. But cut to seven years later and they're still the same people. They've had promotions and a couple of them have gotten married, and one of them has children, but they're about the same. They meet up with no recriminations. Like in a high school reunion, like a family that shared an intense experience that was making the news, and living their imperfect lives. Brooks is too much of humanist to not have it any other way.